Verna Johnston, naturalist, author and photographer, was born in Illinois in 1918. After graduating from the University of Illinois with a graduate degree in zoology, Johnston taught high school in Illinois and California until 1945. In 1945, Verna Johnston was hired as an instructor in Biology and Environmental Science at San Joaquin Delta Community College in Stockton, California, where she remained until her retirement in 1982. Between 1955 and 1972, Johnston studied photography with the famous photographer Ansel Adams and he strongly influenced her technique and sense of composition. Her photographs were exhibited in such prestigious institutions as the Oakland Museum and the Ansel Adams Gallery in Yosemite Valley. A prolific author, Verna Johnston published more than 100 articles in professional journals and popular publications. Her first book, Sierra Nevada (Boston: Houghton Mifflin, 1970) was published as the second volume of the series “A Naturalist’s America,” edited by prominent ornithologist Roger Tory Peterson. In addition to her writing, Johnston also received important fellowships and appointments. In 1959, Verna Johnston was honored with a National Wildlife Federation fellowship in writing and photography. She also received a National Science Foundation fellowship for study at the Desert Biology Institute of Arizona State University in 1963. During the 1960s, Verna Johnston became concerned about the fate of the tule elk, an endangered subspecies of elk indigenous to California. Johnston was an officer of the Committee for the Preservation of the Tule Elk. Johnston was also a member in the 1980s of the Mono Lake Committee. Additionally, Verna Johnston was a founding member of the Calaveras Big Trees Association. Johnston was an active member in many environmental groups, including the Sierra Club, National Audubon Society, and the Wilderness Society. 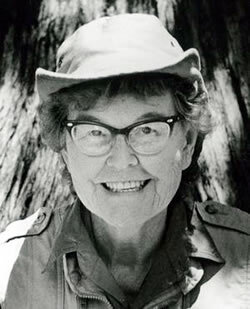 She was also instrumental in establishing Point Reyes National Seashore and Oak Grove Regional Park in Stockton. Verna Johnston died in 2014 at the age of 95.